The reason I chose the Straw Hat’s mechanic Franky as my choice for the White Lantern of this little experiment is really very straightforward. As many of you know, and spoiler alert for those who haven’t read very far in, Franky was a young shipwright’s apprentice, who spent much of his time inventing ships with a lot of firepower, under the tutelage of a shipwright named Tom. Unfortunately, Tom was associated with Gol D. Roger and the World Government came to take him to jail for his involvement with the pirate king. When Tom and his other shipwright’s retaliated, the World Government used Franky’s ships as fire power. In a rage, Franky tried to stop the W.G but ended up getting nearly killed in the process. Using his mechanical knowledge, Franky was able to rebuild his body, giving him the opportunity to live again and to right the wrongs of his past and to work towards dismantling the government that destroyed his body and his loved ones. The White Lantern corps purpose is in a very similar vein. In the DC universe comics, the WLC, for a short while, was made up entirely of DC characters that had died and somehow come back to life. The WLC is associated with a willingness and determination that trumps even the Green Lantern corp. There is still much mystery surrounding the White Lanterns: who is going to be the “chosen lantern”, their purpose in the scope of the entire universe and their overall abilities but I notice something interesting about the White Lanterns. When a character assumes the identity of White Lantern, there is no set costume to go along with the corp. The symbols and colors cover what the person is already wearing. Thus, Franky’s costume was very simple and fun to make. Pretty straightforward, like I said. Just more or less change everything (including the stars) he has on, which is not much, to white. 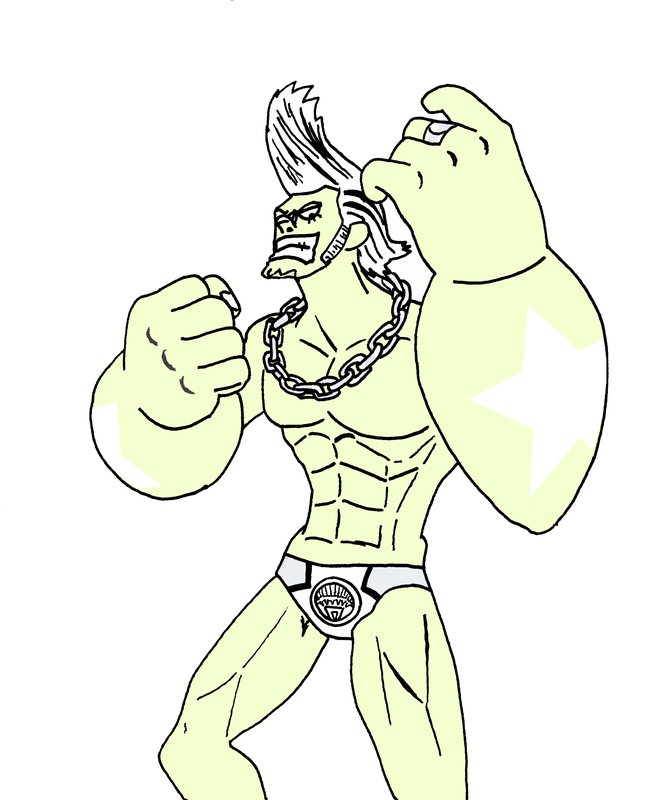 It’s a great color for Franky; normally he’s wearing so much that he’s too loud in my opinion. Although he is a character who is loud & proud, his hawaiian shirts are just too much. White represents new beginnings, wholeness and completion, which is just perfect for Franky.